Here you can find information and details about my Android applications, and android development in general. 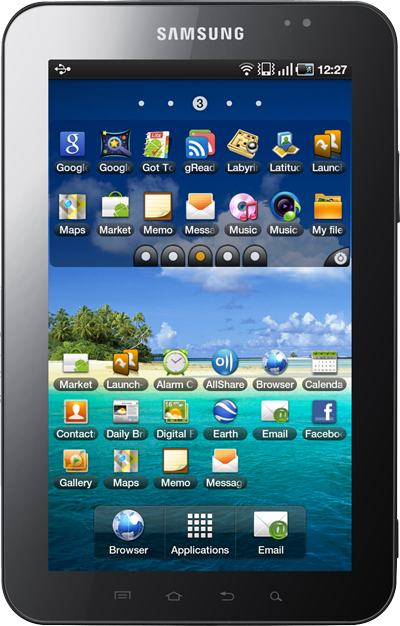 Honeycomb support Launch-X is now fully compatible with Honeycomb tablets (Android 3.0/3.1/3.2). The overall layouts have been specifically optimized for large screens. 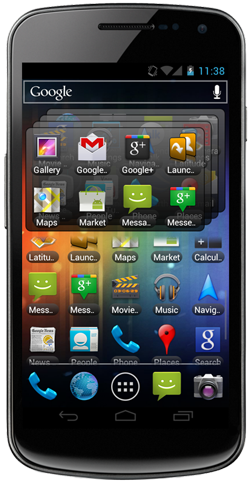 Ice Cream Sandwich support Launch-X is now also compatible with the latest Android version - 4.0 (Ice Cream Sandwich). NEW Stack Widget Since Android 3.0 a new widget has been introduced: Stack widget - you can swipe up/down through the Launch-X screens. You can find it on the Android Market for only 1.49 EUR (or 1.99 USD). 04.10.2011 - Released an update for Launch-X (v1.8.0). Scrollable widgets You can now create scrollable widgets when using Homescreen launchers that support those (such as ADW Launcher, LauncherPro, GO Launcher, etc.). You can enable this option when creating/editing a widget under the 'Appearance options'. Widget sizes New widget sizes have been added: 3x1, 3x2, 4x1, 4x2, 5x1 (for Tablets) and 5x2 (for Tablets). 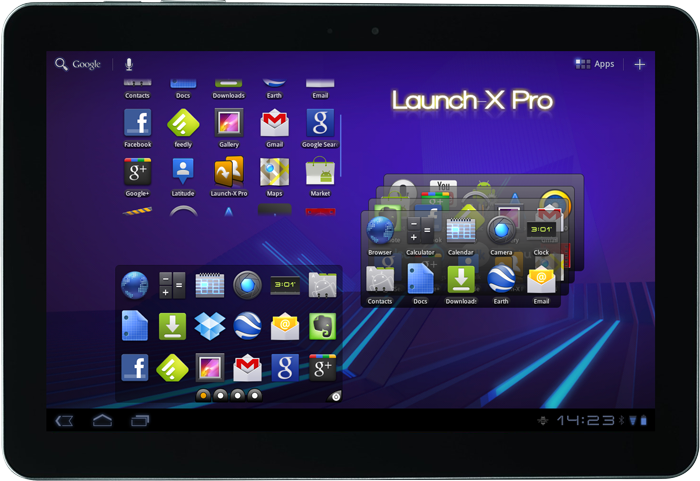 Launch-X is now compatible with the Samsung Galaxy Tab! Non-scrollable widgets can now contain up to 4 rows of items, while scrollable ones can have an unlimited number of items/rows. Support for widget resizing If the Launcher you are using supports resizable widgets you will be able to change the size of the Launch-X widgets to any dimension (e.g. 4x3, 3x3). To change the size of a widget when using a launcher that do not support resizable widgets you will have to remove it first and re-add it by selecting the new desired size. Optimizations The performance of widgets reloading has been greatly improved. This means that in case Launch-X is killed by the operating system and you click on a widget-button to refresh it, you will only notice a slight lag, but no 'Loading widget..' ;), and a much improved response time. Also, a new mechanism of widget disk-caching has been introduced to speed up even more widget reloading when Launch-X gets killed. This caching mechanism uses the phone internal memory, so if you are low on memory I encourage to disable it. You can enable/disable this under the Launch-X Settings. Improved Landscape mode When using the Launch-X widgets in landscape mode the icons will now remain as large as possible (to fit the widget). In the widget appearance options you can also select whether to Reduce text size in landscape mode. This can help to have slightly larger icons, since the height of the widgets becomes much smaller in landscape. Instead, it can be useful to disable this setting if are using for example one row with no arrows/buttons and you want to keep the text normal. Widget preview The widget preview of the Widget Editor has been improved to deal with the available widget sizes. Also, a part of your selected homescreen wallpaper is now shown under the widget, which lets you see how the widget will look on your homescreen. Widget updates In case a widget gets stuck on the homescreen and it won't update, an option to manually force-update it has been added. Simply long-press a widget (in the Launch-X widgets list) and select Update on Homescreen to trigger this force-update. If you are looking for a specific/different color please contact me. Settings A 'Settings' window has been added which allows enabling/disabling 'widgets caching' and 'boot update'. You should enable 'boot update' if you are experiencing never-loading widgets after the phone boots up. When this option is enabled the widgets will be force-updated after boot is completed. 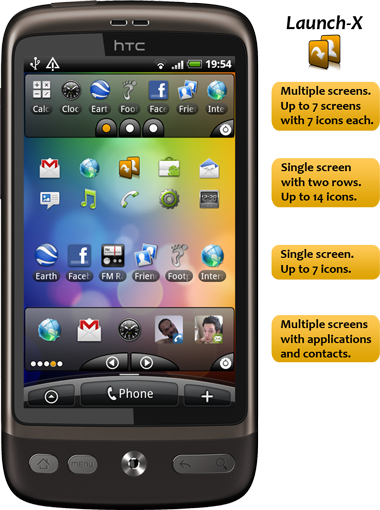 16.07.2010 - First release of Launch-X, a widget for your homescreen that gives you quick-access for all your applications and contacts! Get it on the Market for only 1.49 EUR (or 1.99 USD). 03.07.2010 - update released for DigiWatch (v0.31). Small bug fix. 16.06.2010 - update released for DigiWatch (v0.30). Solved 'time freeze' issues. Added more date formats and support for QVGA phones. 11.06.2010 - update released for NetSMS (v1.1.49). Improved stability and error reporting. 06.06.2010 - update released for NetSMS (v1.1.4). A donation link has been added in the application. 04.06.2010 - first public release of DigiWatch Widget (v0.20), a simple digital clock for the android home screen. 02.06.2010 - update released for NetSMS (v1.1.3). Free ('FRI') users of the provider Coolsms can also use NetSMS now! 24.05.2010 - update released for NetSMS (v1.1.21). Added a new Swiss SMS Provider: Yallo. 13.05.2010 - update released for NetSMS (v1.1.0). Added a new Swiss SMS Provider: Coop Mobile. This version is also more stable, and faster. 06.05.2010 - update released for NetSMS (v1.0.9). Added another Danish SMS Provider: Coolsms (for Coolsms Pro users only). Also, the contacts list integration has been improved. 07.03.2010 - update released for NetSMS (v1.0.7). Added a Swiss SMS Provider: M-Budget. 28.02.2010 - update released for NetSMS (v1.0.6). Added a Danish SMS Provider: Bibob.dk. 21.02.2010 - update released for NetSMS (v1.0.5). 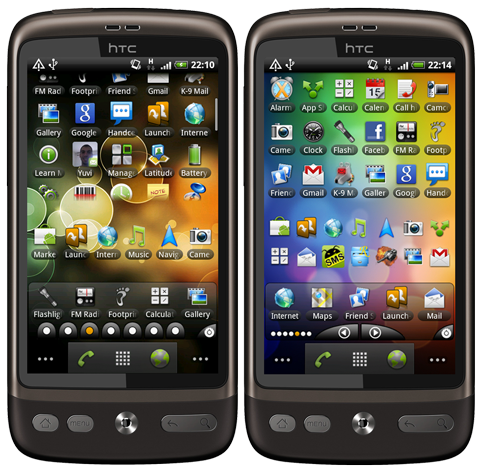 Added support for QVGA phones (like HTC Tattoo). 16.02.2010 - update released for NetSMS (v1.0.3). Added a new SMS Provider: Schoolnet. Also a character encoding problem has been fixed, and some more icons have been added (to the notification statusbar). 07.02.2010 - update released for NetSMS (v1.0.1). Now the sent messages are stored in the Android Messaging app (this can be disabled in NetSMS Settings). An 'incoming sms' notification is available, which allows to quickly reply to the received messages using NetSMS (this can be enabled in the app Settings, by default it is off). 31.01.2010 - first public release of NetSMS (v1.0.0), an application that allows sending sms messages through existing web providers (currently supports Ticinocom, Sunrise and Orange). You can download it for free from the Android Market. For more details visit the NetSMS page.